Our PTFE fabric consists of a fiberglass substrate which is then coated with PTFE (polytetrafluoroethylene). This combination provides a superior non-stick surface and dimensional stability, allowing your equipment to work smoothly and more efficiently. These fabrics are designed for durability and long life at high temperatures, resulting in less production downtime. PTFE fabric withstands the high temperatures of heat sealing applications, while allowing the proper rate of heat transfer from the sealing unit to the package. It is also resistant to tears, punctures and abrasions. For these reasons, they are widely used on L-bar and table top impulse sealers. 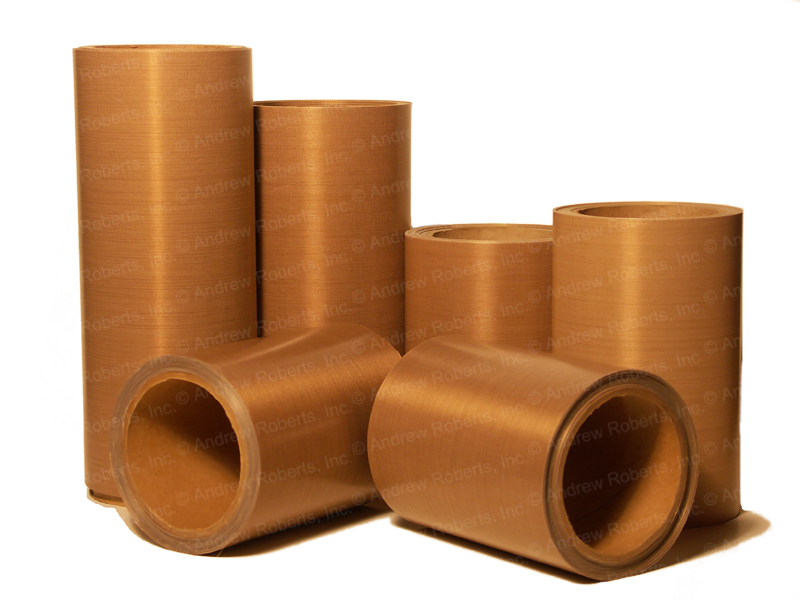 This series of PTFE coated fiberglass fabric was designed for use in the flexible packaging industry where excellent release, temperature resistance (500°F), durability and economy is required. Of course these products have found their way into many other applications such as: cooking sheets, gaskets and non stick, high temperature conveyor belting to name a few. These PTFE Glass Fabrics have a very smooth surface and provide excellent release characteristics. Uses include: covering of heat sealing jaws, gaskets, conveyor belting, non stick surfaces for food processing and electrical insulation. Many of these glass fabrics can be certified to various military & aerospace specifications such as Mil I-18746B, which is now A-A-59300 & AMS 3666D Types 1 & 2 Please notify customer service of desired specification when ordering. Ultra High Molecular Weight Tape is a linear polymer with a pressure sensitive acrylic adhesive on one side.